The Rack Jack is a new range of products that provides simple, cost effective lifting or precise positioning of loads from 180 – 1800 Lbs. Rack Jacks come in 3 sizes and are available with one or two pushers (racks). Based on the simple mechanical principal of rack and pinion combined with a robust square housing, Rack Jack ensures reliable operation for a long lifetime. Four standard input options as well as customized designs are available. 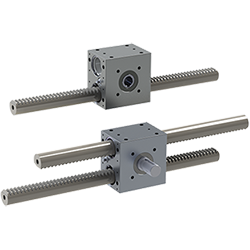 The user friendly robust design is customizable with integrated gearboxes, protective covers, specific housing designs and shaft end machining to meet application requirements at a great price.